We continued our experience at Animal Kingdom with some special Christmas characters pictures with Santa Goofy and his reindeer pup, Pluto. 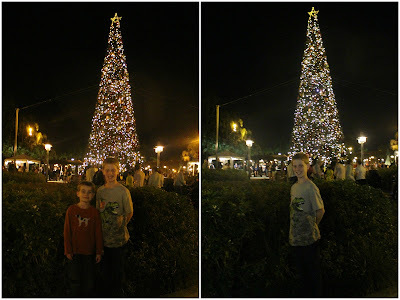 Evan and Brody really loved them. 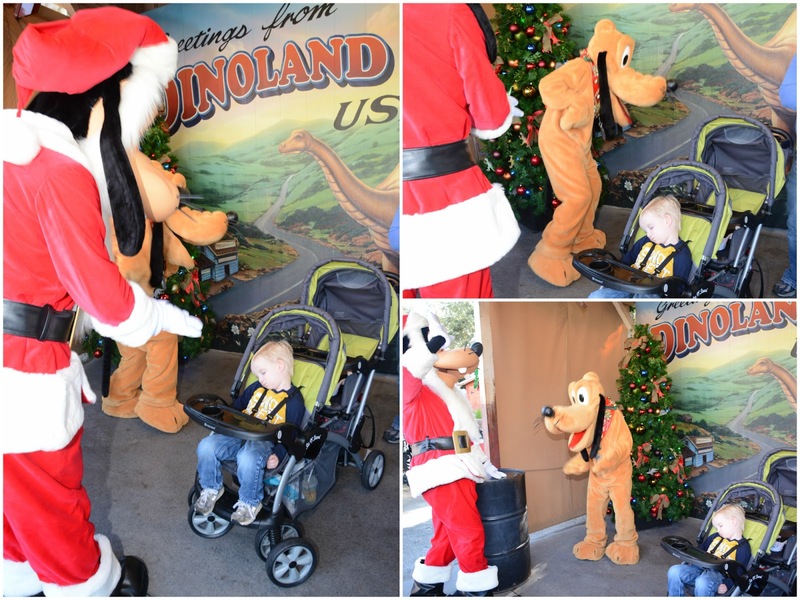 Sadly, Mattox had fallen asleep in line, but this really gave the characters a chance to put on a little show. They tiptoed quietly around sleeping Mattox in the stroller and were giving everyone the shush sign not to wake him up. 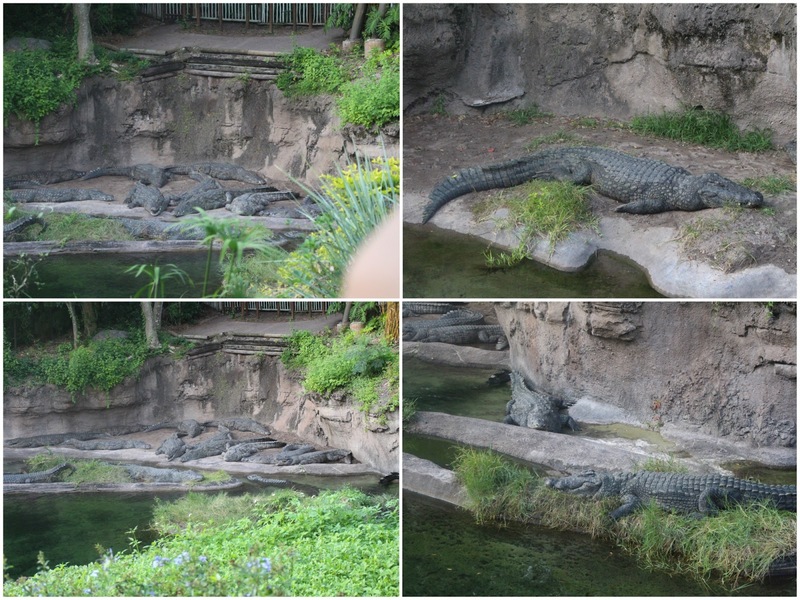 It was so cute. Evan and Brody got some good hugs. 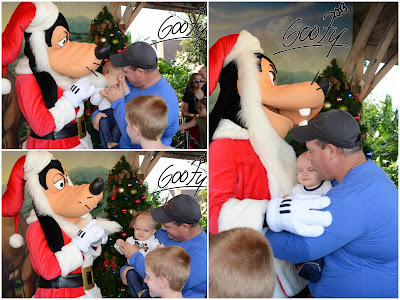 Baby Grayson said Santa Goofy's beard tickled. 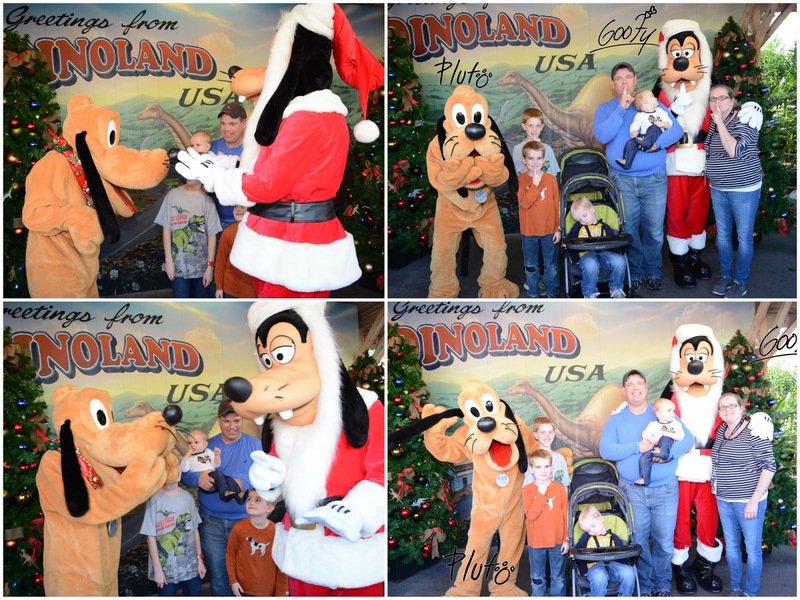 Our pictures included sleeping Mattox, and we all were very careful not to wake him up. 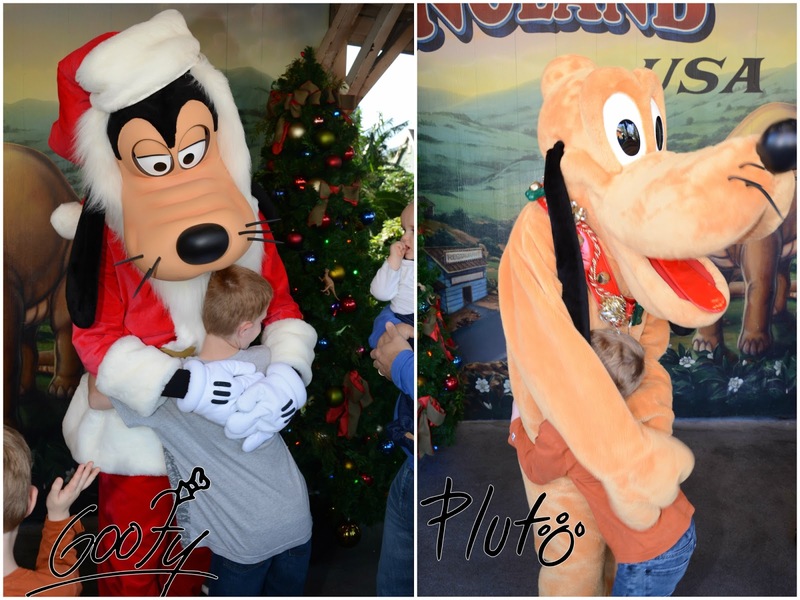 Sweet Santa Goofy and Pluto. Mattox will love these pictures one day. After a busy and fun morning and a late lunch at Tusker House, we couldn't wait for our safari ride through the beautiful and natural animal habitat. Although some would say this is not the same thing as a "real" safari, we aren't all so privileged to be able to enjoy a safari trip to Africa while our kids are small. 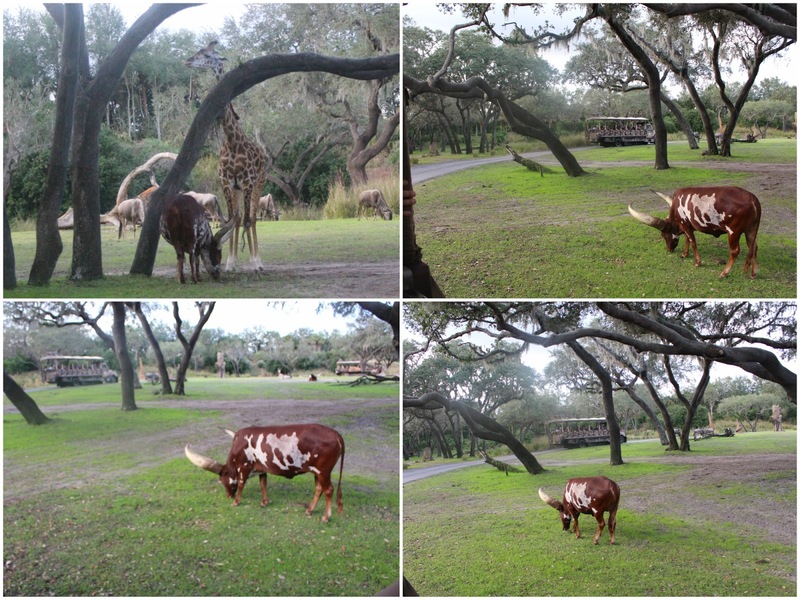 Animal Kingdom is a beautiful animal sanctuary set on huge acreage to accomodate and preserve many native species from around the world. The animals enjoy their freedom and protection from poaching and other hazards of the wild, and we get to enjoy seeing them in a native habitat. 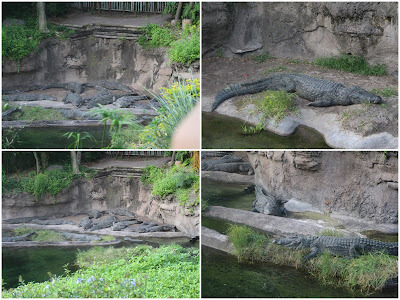 I don't really love zoos that keep animals in "cages" so that people can see them better. I like zoos like North Carolina's which are more like an animal sanctuary where the animals roam free in huge natural habitats. Animal Kingdom has also done a wonderful job preserving animals in a natural and animal-friendly environment. 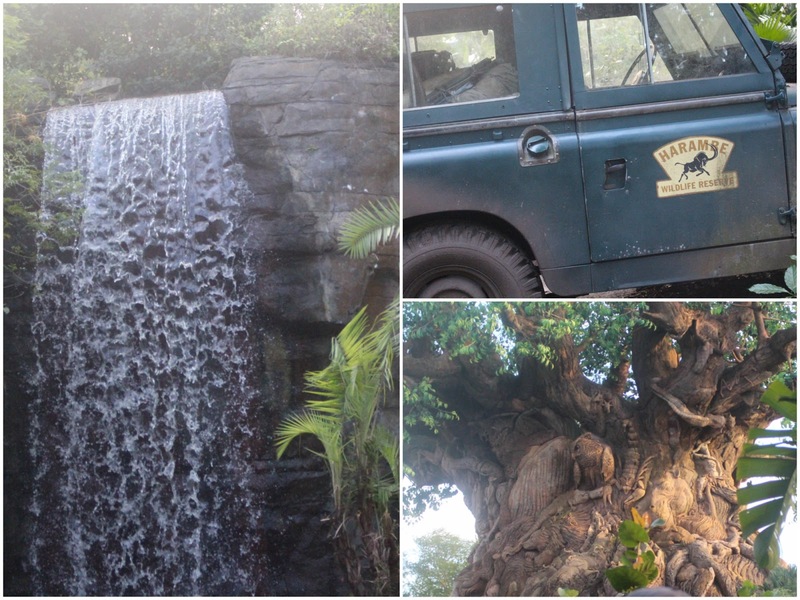 The safari vehicles are simlar to those you would ride on an African safari on a nature preserve. First, we spotted a striped Kudu. 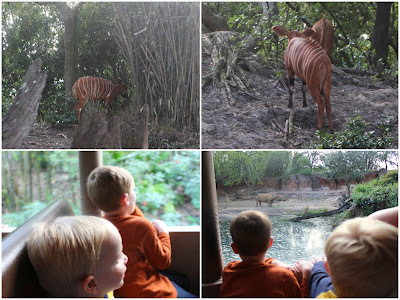 The boys spotted some rhinoceros from the open safari bus. 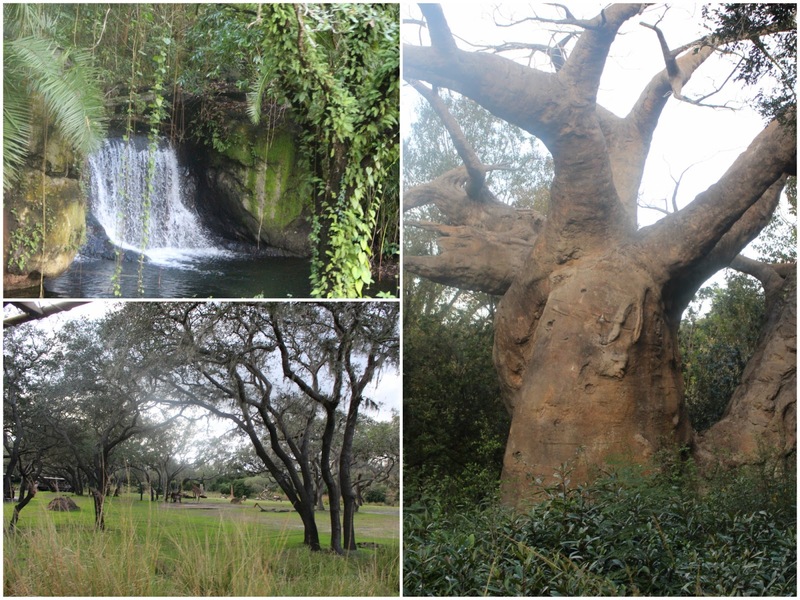 A beautiful waterfall, native grasslands, and a baobab tree. 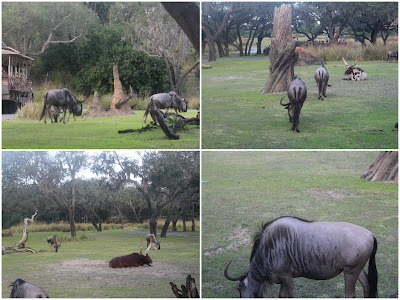 African wildebeest roaming around the grasslands. Beautiful giraffe. I remember loving all of the giraffes when we stayed at Animal Kingdom Lodge and could just watch them from our resort. 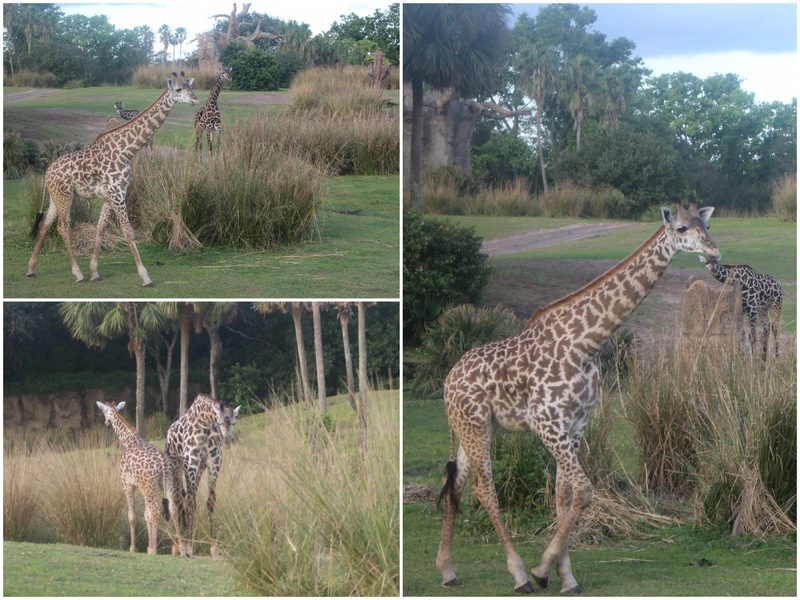 Look at the baby giraffe with its mother. Awe! 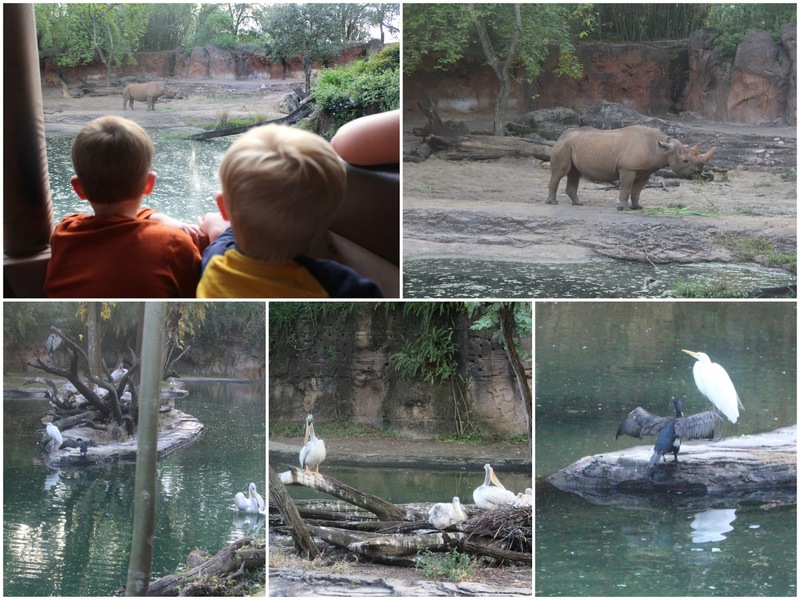 I love animal watching with my boys. 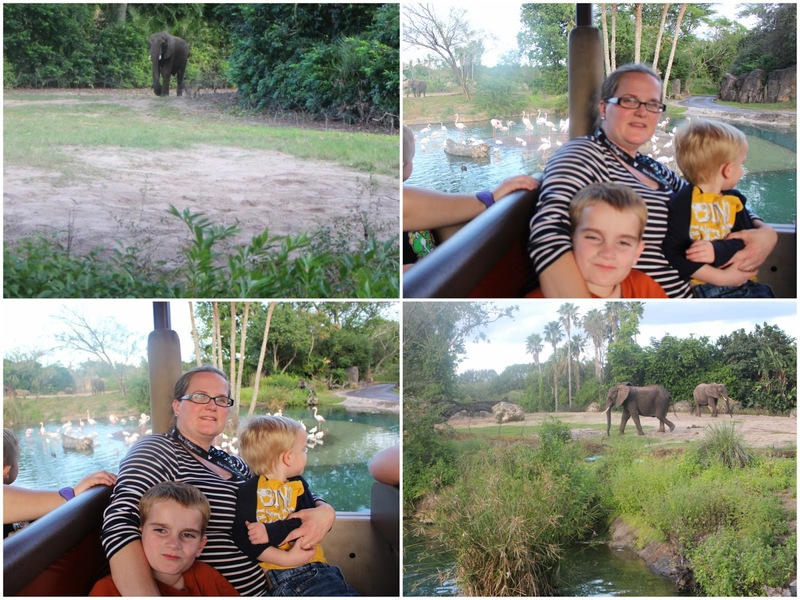 We loved spotting the elephants and finding the matriarch elephant. 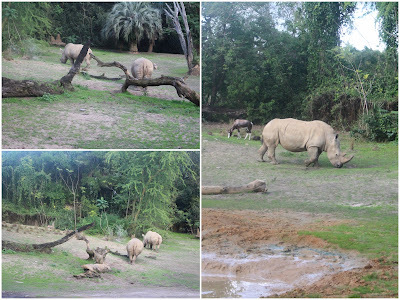 Some more rhinoceros closer this time. 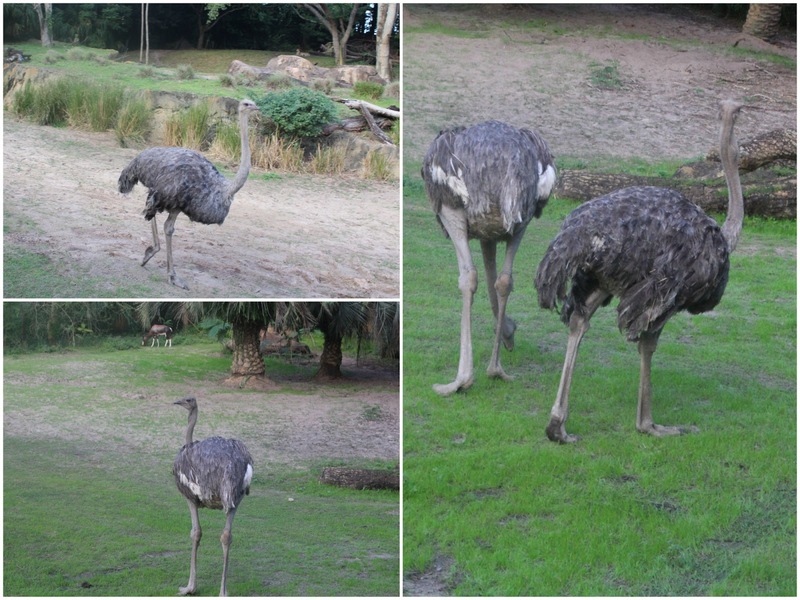 Evan's favorites are the ostriches because they can run so fast. Lazy sleeping lions, and a cheetah way at the back of the habitat. 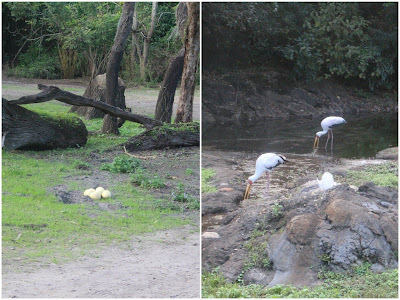 I think that is a nest of ostrich eggs and some cranes in the water. 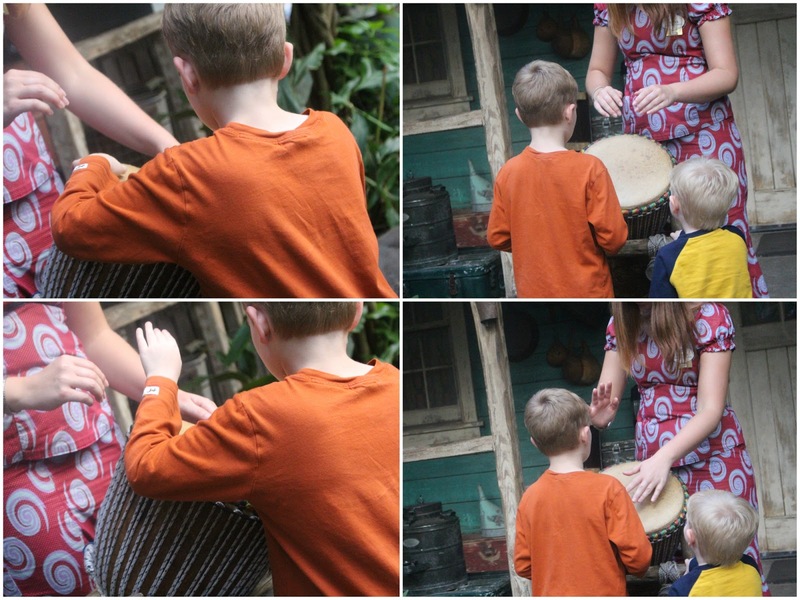 These boys loved learing to play the African drums. 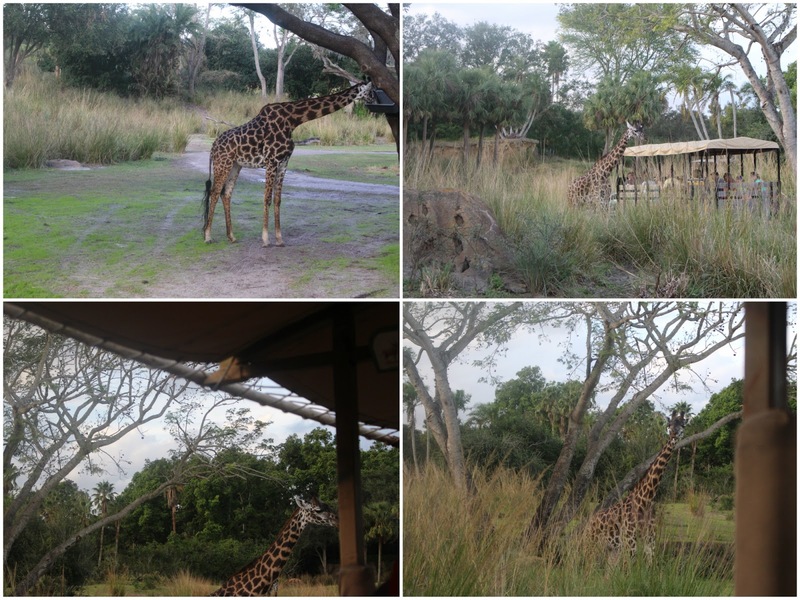 Some sights around the park after we left the safari. After our safari ride, we had a little wet and wild ride on an Asian whitewater rafting adventure. 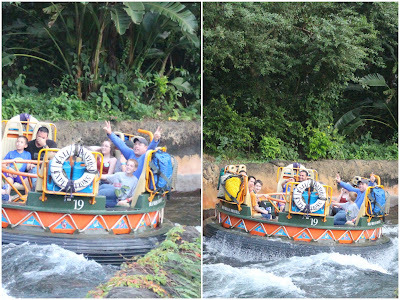 A ride on the Kali River. Brody enjoyed pushing the buttons to get the passengers on the ride wet. I don't know if it worked. 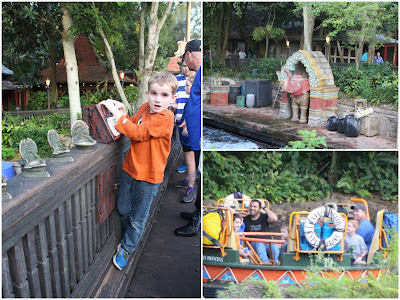 We spotted Daddy and Evan on the ride. 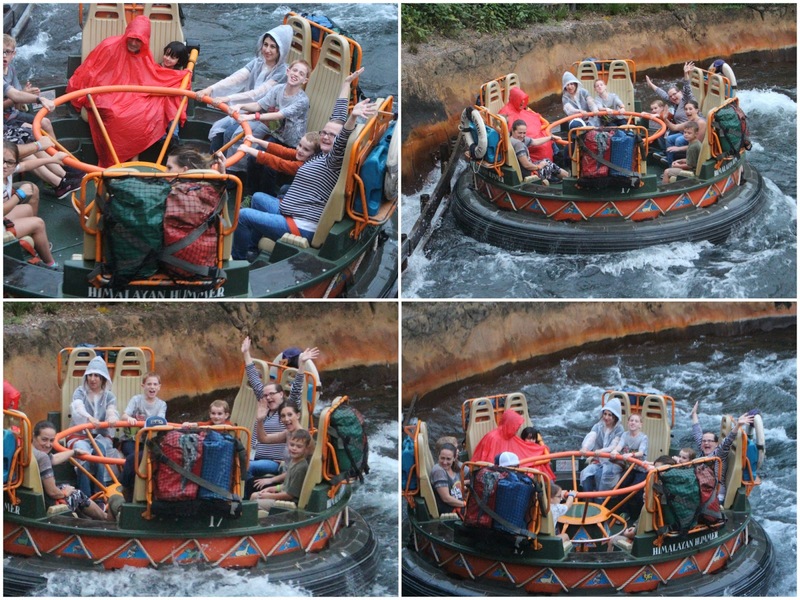 Then, it was our turn to ride! 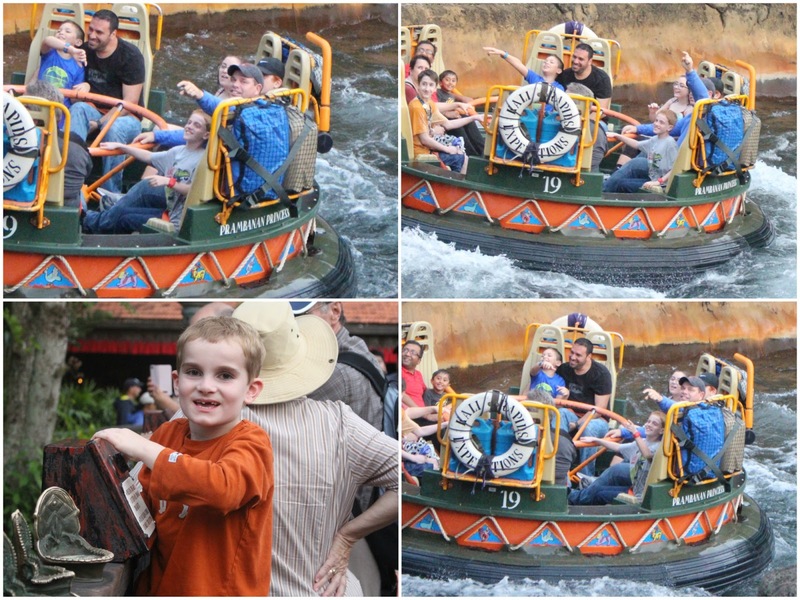 Evan got to ride twice. 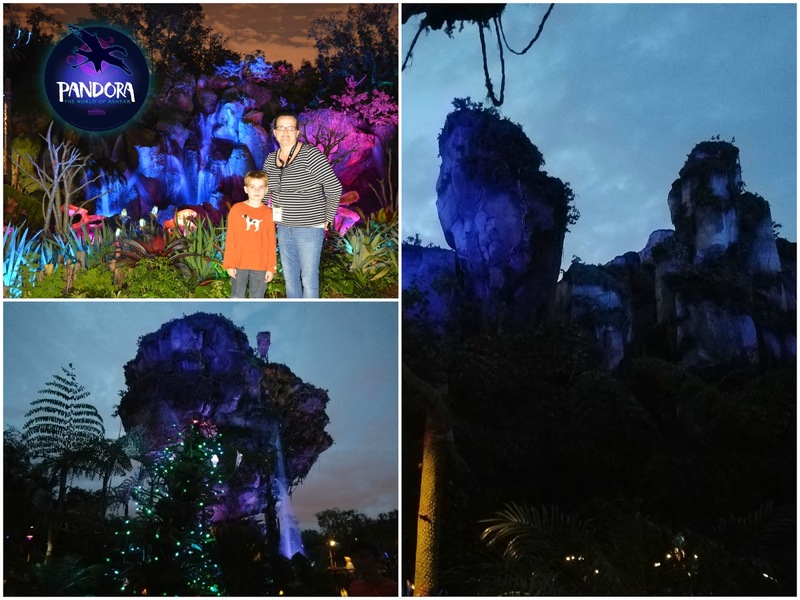 As the sun set, we walked back around the Tree of Life which was lit up for the night to visit the spectacular Pandora World of Avatar. 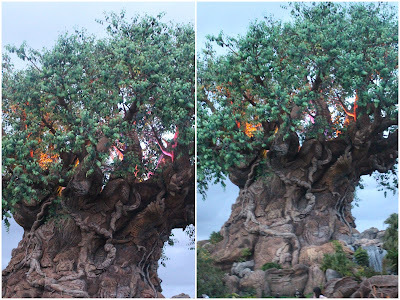 If you haven't seen the movie "Avatar," you may not appreciate this area of the park. 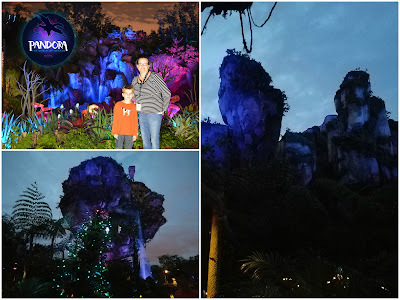 "Avatar" is a science ficture drama that takes place on a planet which humans discovered in the future in their space explorations and have set up a military camp to procure some newly discovered natural resources that have become extremely valuable in the future. Pandora is inhabited by a human like species called the Na'vi, and human scientists are studying and learning from the Na'vi about the "magical" qualities of the planet. All of the plant and animal species on the planet seem to be interconnected through an amazing network like one huge nervous system. The Na'vi live in harmony with their planet in a huge tree until the humans want to blow it up to get to their precious resources. The scientists and one military hero who falls in love with a Na'vi girl attempt to save the Na'vi and the planet from the humans. The humans created Avatars that look like the Na'vi that they can use to communicate and interact with the Na'vi. 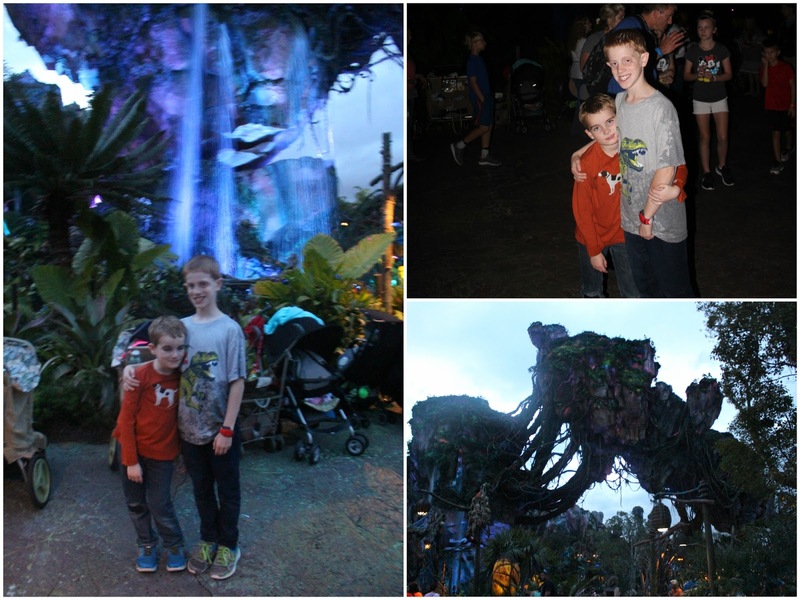 It is a really sweet movie, and the special effects depicting the amazing world of Pandora are the best parts. There are islands that float in the air, and the animals and plants all glow with beautiful colors and life. 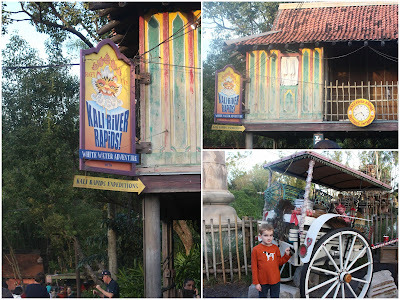 Disney really did a fabulous job recreating the magic of this land at Animal Kingdom. It was really beautiful at night although difficult to photograph in the dim light. 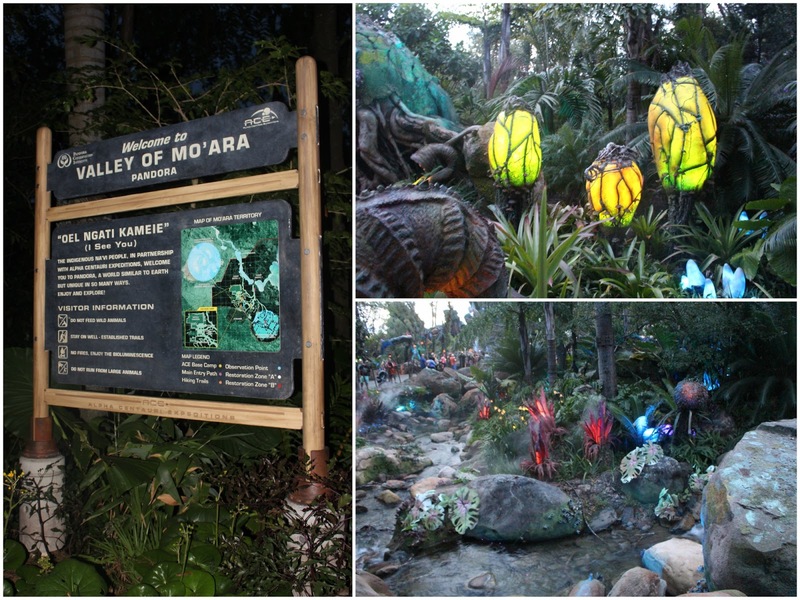 Pandora is about as special in its creation as the fabulous Harry Potter world at Universal Studios. I just love all the special details. 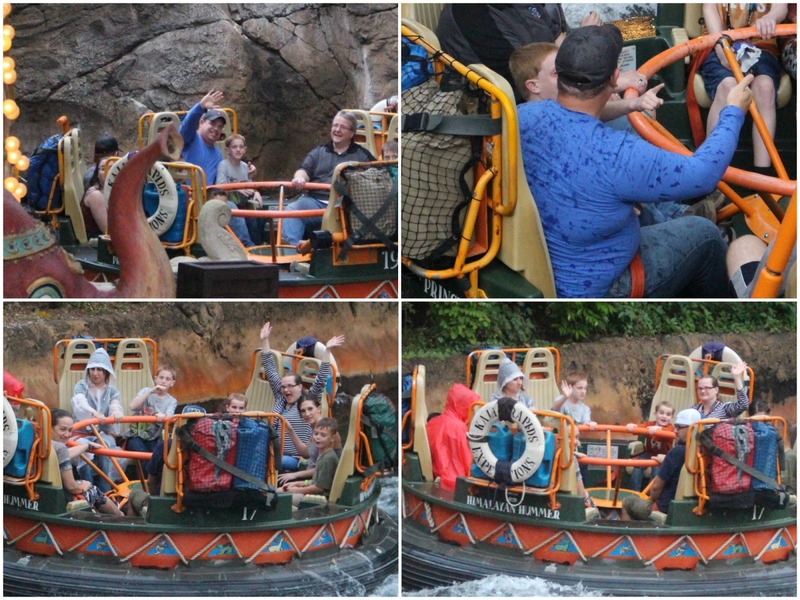 There were two rides in the Pandora world. We rode the Na'vi River Journey which allowed you to ride through the land of Pandora. 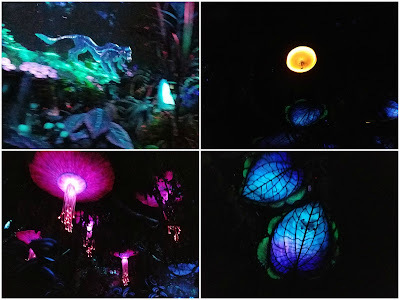 We didn't get a chance to ride the Avatar ride which is more of a simulated motion ride and 4D movie experience in the fashion of Soarin' at Epcot and Star Tours at Hollywood Studios. These experiences feel a little "flat" when compared to the awesome actual rides with movie effects that are on all of the rides at Universal Studios. I am not blasting Disney versus Universal Studios, but my honest opinion is that Universal has done a phenomenal job with their rides and that Disney doesn't have anything comparable yet. 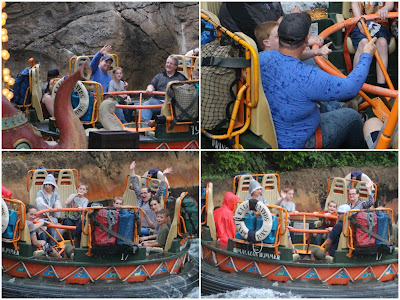 Disney is a better experience for younger kids though because most of the rides at Universal are too big for younger riders. My advice is to take younger kids to Disney and older kids and teens to Universal Studios. See, I support both parks equally! 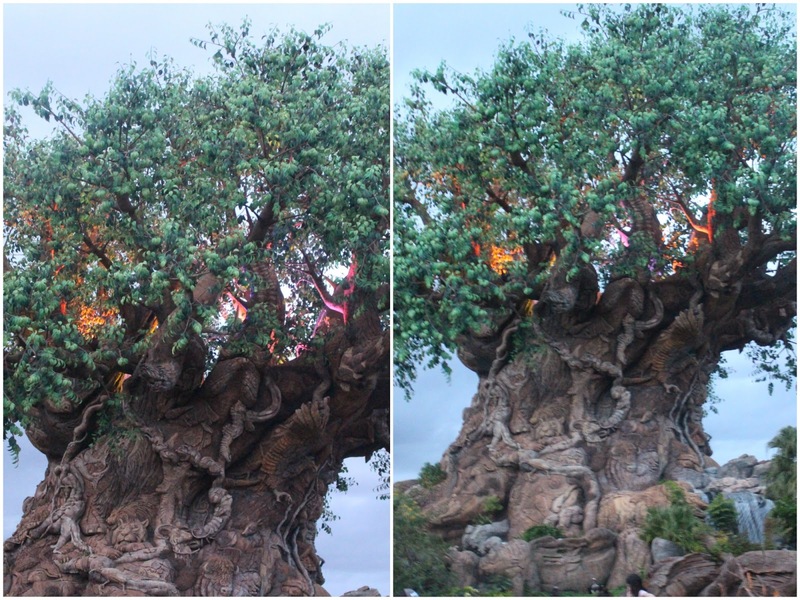 The Tree of Life starting to light up at night. The nighttime shows aren't as fantastic at Animal Kingdom. Last trip, we left this park earlier to enjoy our hotel more, but we did want to experience Pandora world at night. 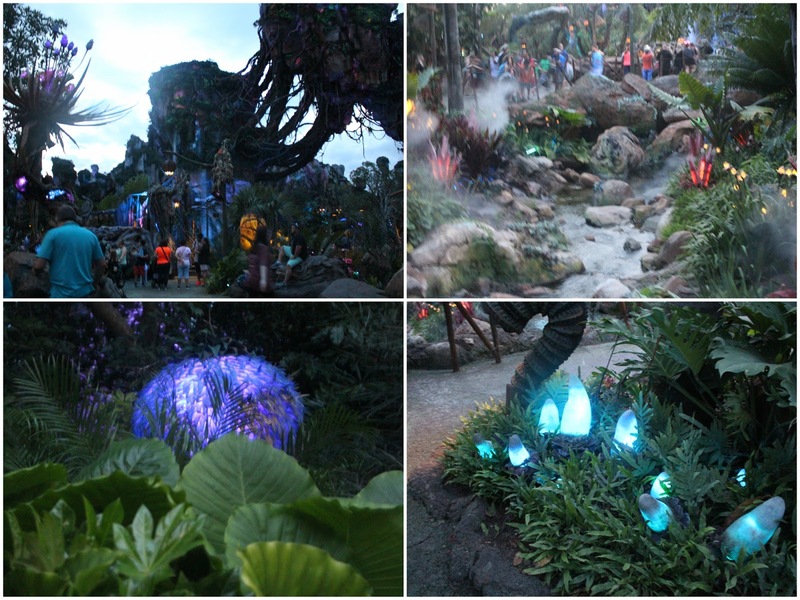 Entering Pandora and spotting some beautiful glowing foliage and plants. I wish my pictures of the floating mountains were better. They were beautifully constructed to look like the floating mountains from the movie. 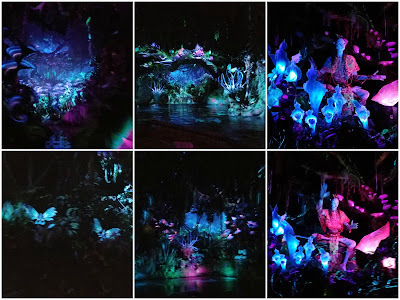 Beautiful glowing waterfalls pouring down from the floating mountains. Brody and I got separated in the dark from Eddie and the other boys so we got our picture taken by a photopass photographer. On the Na'vi River Journey, we saw glowing animals and moving plants like they flowers that floated up into the sky. A beautiful glowing world came to life, and the mother queen of the Na'vi greeted us. 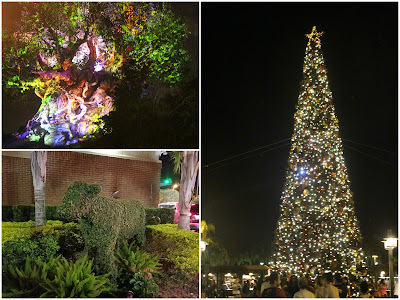 The primary nighttime spectaculars were the lit Tree of Life and big Christmas tree. 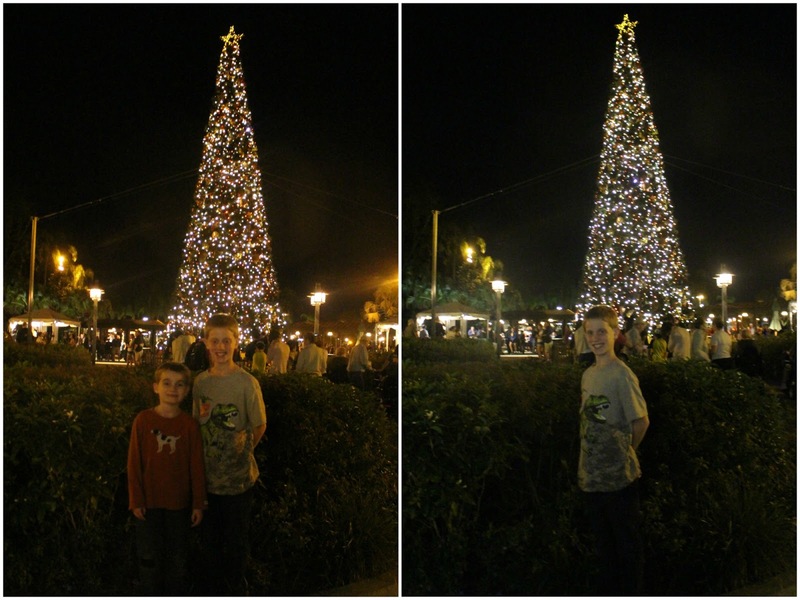 My big boys in front of the big tree. 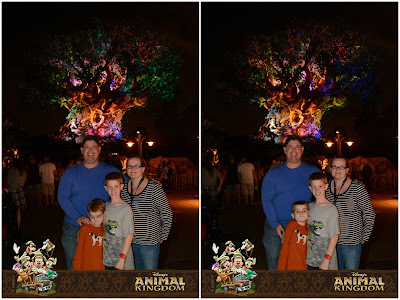 And one last picture in front of the Tree of Life at night. 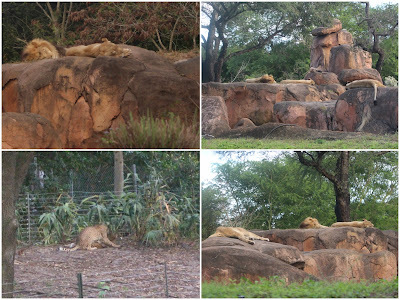 Yes, the younger boys were asleep again.